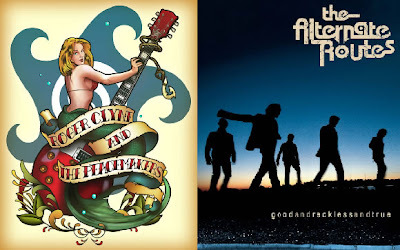 This news just made my day - The Alternate Routes have just announced a fall tour with another Fuel/Friends favorite, Roger Clyne and The Peacemakers! This is most excellent news. I have been waiting to spring on an Alternate Routes tour since I first learned about them a few months ago, and have been listening to their Good and Reckless and True album non-stop ever since. I'm sold on their expansive, golden, rootsy-rock sound and smart lyricism. And I think you know how I feel about Roger Clyne; together with his band The Peacemakers, they definitely put on one of the best, heartfelt, sweat-drenched, rocking shows I've seen. Ticket prices range from like $8 to $20 -- an absolute steal for this much heart. I guarantee you will enjoy the show. What?! No Texas dates? I've seen RCPM twice now and they put on one of the most amazing shows I've ever seen, and to know that The Alternate Routes are on the Fall roster just makes me drool. I may seriously have to fly out to one of these shows, 'cause this is too much to pass up! Bah, no Vermont dates either - I was fortunent to catch them up here when they played a free show in Burlington. Great set, really had some good stuff there. I'd love to see them again. Your timing's great, I was going to highlight them on my own blog today. I now have additional information to give out. I just have to chime in with a "I totally agree with Heather" post!